"Gay &amp; Queer Detectives Stories in the time of criminalisation"
It's the Roaring Twenties. Homosexuality is a crime in Britain, yet London is home to a thriving queer underworld. In the bohemian bars, the Turkish baths and the public lavatories, gay men and women find love through secret codes and signals. But when your very existence is a crime, who can you trust if not the police? Hugo Fox and Theodore Bellamy are partners, in life and business. 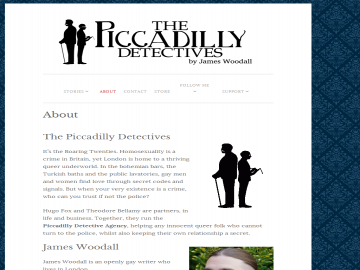 Together, they run the Piccadilly Detective Agency, helping any innocent queer folk who cannot turn to the police, whilst also keeping their own relationship a secret. The Piccadilly Detectives has not been tagged yet. Help others find The Piccadilly Detectives by tagging it! The Piccadilly Detectives has not been reviewed yet. The Piccadilly Detectives has not been recommended yet.